On Saturday April 5th the 175th Grand National will be taking place at Aintree. This year’s event is the first to be backed by local sponsor Crabbies and the first £1 million Grand National to be run. The groundsmen have been busy putting the final touches to the course’s famous obstacles, putting down the distinctive green, freshly cut spruce over the fences, over the four and a half mile race. Of course the bookies are also busy preparing for one of the biggest betting events in the horse racing calendar. Paddy Power currently has the Rebecca Curtis-trained Teaforthree as favorite with odds of 10/1 and the 2011 Gold Cup winner, Long Run, is next at 12/1. Following the two leaders is Tidal Bay at 14/1, Monbeg Dude and Sunnyhillboy at 16/1 and Prince De Beauchene, Balthazar King, Triolo D’Alene, Rocky Creek, Burton Port and Pineau De Re all at 20/1. Paddy Power is paying five places on the Grand National and the race has been designated as a ‘Non Runner, Money Back’ by the bookie. 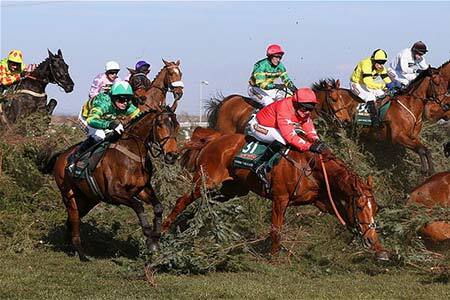 A total of forty horses run in the Grand National, however, the final line-up has not yet been decided.